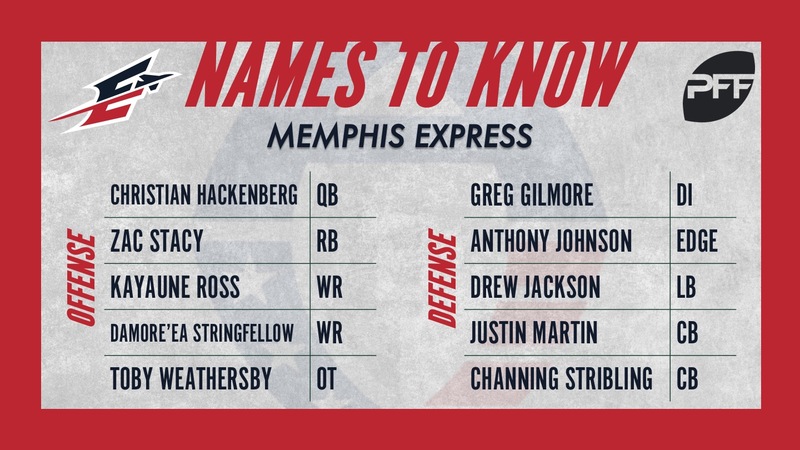 We continue the list today with the Memphis Express, head coached by Mike Singletary. The former second-round pick from the 2016 NFL Draft will arguably be on the shortest leash in the AAF, as proven NFL backup Zach Mettenberger sits right below him on the depth chart. Hackenberg’s 2015 season at Penn State saw just one game in which he graded above 77.6, but his career consists of 10 game grades with a mark under 50.0. He’s become a name to watch just to see how long he’ll last on the field, as he was the lowest-graded quarterback during the Express’ preseason opener. A proven NFL running back, Stacy brings with him 357 career carries and 1,363 total rushing yards to the Express backfield. His career grade trajectory is on the downslope so he’ll have to hope he can revitalize a career that last saw meaningful snaps in 2015 with the New York Jets. He did show the ability in his 2013 rookie season to break tackles, something he did 25 times that year, en route to 612 yards after contact, so the talent is there. A big, physical target at 6-foot-6, 224 pounds, Ross never really dominated while at Kentucky or in an NFL preseason camp like he did during training camp with the Express. He’s a big-bodied receiver who should line up outside and be a contested-target machine for Hackenberg (or Mettenberger) at quarterback. Flashing big-play potential in what is the high-flying Ole Miss offense, Stringfellow caught 60.7% of his targeted passes in his two-year stint of grades with the Rebels. He averaged 14.9 yards per reception and gained 382 yards after the catch and likely would’ve stuck around with an NFL team had his drop issue not carried over from his final season at Ole Miss when he dropped 10 of 56 catchable passes thrown his way. Scrap the drops from his resume, and he’s as talented as they come. A stalwart along the offensive line, Thomas spent 1,761 snaps over four seasons with the Miami Dolphins before exiting the NFL in 2017 after a preseason camp with the Philadelphia Eagles. Thomas is a big man in the middle and should anchor the Express interior offensive line. He will, however, need to tighten up his pass protection as he allowed 100 total QB pressures on 1,138 career pass-blocking snaps. Gilmore is a space-eater up front, logging 1,362 snaps during his time at LSU. He never graded below 64.5 overall and turned it on during his final season in 2017 when he managed 29 QB pressures that included 13 combined sacks and hits. If he can continue to improve and add on to that pass-rushing skill set, Gilmore could dominate up the middle for Memphis. Johnson bounced around the AFC East in his time in the NFL, seeing regular season snaps for the Miami Dolphins, New England Patriots and New York Jets. His experience and size off the edge could be key for a young defense. Jackson hasn’t played since a 2014 season with the Indianapolis Colts but being selected as a captain at linebacker with a Hall of Fame LB as your head coach must mean something. In that 2014 season with the Colts, Jackson put forth an above-average game grade just once and logged all of just 59 snaps. During the season-opening scrimmage though, Jackson was stingy in coverage and a sure tackler as he flew all over the field for Memphis. Martin should anchor one of the starting outside cornerback spots opposite Jonathan Cook as his large frame of 6-foot-1 is coveted for secondary players. In three seasons at Tennessee, Martin allowed just 52.9% of his targeted passes to be caught while bringing in an interception and eight additional pass breakups. Another defensive back from Michigan, Stribling put forth an elite overall grade in his final season in Ann Arbor in 2016 when he allowed just 30.2% of the passes thrown his way to be caught. He put forth, what was at the time, a PFF record for lowest passer rating when targeted of just 22.7. For comparison’s sake, if a quarterback just spikes the ball every play, he gets a 39.6 passer rating. Stribling has the coverage ability and instincts of an elite cover corner, he just needs the time and reps to show it.